Introduce a peaceful calm to your home decor with this triple Thai Buddha tealight holder. 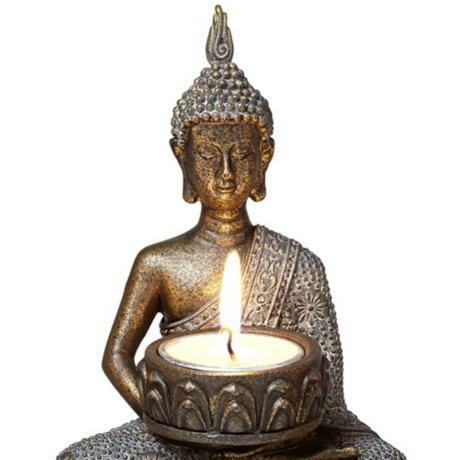 This three-tealight candle holder allows you to illuminate your space with natural light and the serenity of the Buddha. Three Thai Buddhas beautifully clothed in textured wraps sit on a curved platform, in warm bronze finish, each holding a candle on his lap. Three tealights are included with this peaceful candle holder. Here is how the Thai Buddha landscape will transform your room! • Buddha 3-tealight candle holder. • Includes three tealight candles.